Known as the “Queen of fashion,” Elsa Schiaparelli was born in Rome, Italy in 1890. Gabrielle “Coco” Chanel referred to her as “that Italian artist who makes clothes.” But she was an inventor as well as an innovative designer. Creator of the original wrap dress, she referred to herself as “Schiap“. Schiap was encouraged to “invent” dresses or costumes. She didn’t think of dress designing as a profession, but as an art. Schiaparelli’s acquaintance with the renowned surrealist artist, Salvador Dali, resulted in marvelous collaborations. 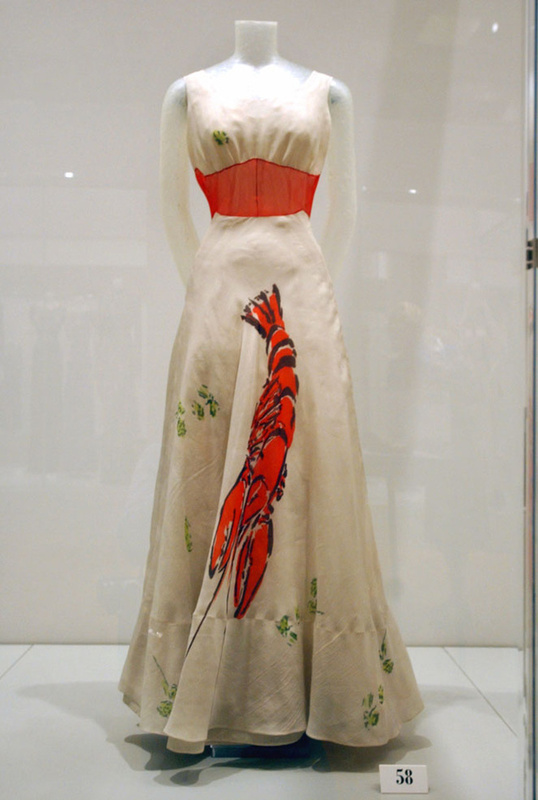 Dali was the source of the most famous of all Schiaparelli gowns, the lobster dress. She translated the theme into a sleeveless evening gown in white organza with a flaring skirt on which a gigantic lobster had been screen printed. The dress was famously worn by Wallis Simpson in 1937, the year of her marriage to the Duke of Windsor.